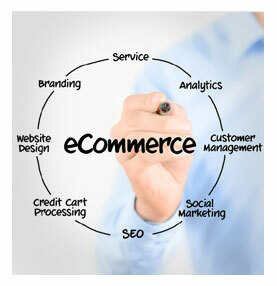 What type of e-commerce solution do you require and how in-depth will your online store be? Below are a few examples, from super simple to full-blown custom shopping carts. There is no such thing as ‘the best ecommerce system‘, it really all depends on finding the right e-commerce solution that fits you and your business. Visitors must print and fax order or phone order in. Single page secure order form that sends each order as an e-mail. Visitors can pick products while continuing to look at the site, change their order, preview order and submit on-line. Order sent as e-mail or downloaded via FTP from the server. Has automated real time credit card processing, integrated with back end database and robust shopping interface with coupons, shipping, customer email marketing and up-selling on checkout. List all credit cards the site will accept. (Visa, Master Card, AMEX, Discover). Merchant accounts should allow for taking on-line orders from the Internet. Please check with your bank as violation of these policies can result in termination of your merchant account. Policies differ from bank to bank. List all of methods of payment options (money order, check, internet check, various credit cards, etc.). List any special shipping and handling charges or constraints on international orders. How will shipping and handling charges be automatically calculated for on-line domestic and international orders? Will international order shipping charges be calculated manually? List information such as harmonized codes, taxes, duty, etc. which can help expedite orders and reduce international costs. Shipping products internationally can be complex and costly. Will a consolidator or international tracking system be helpful? How will sales tax be calculated for on-line orders? Will you need to know the tax rate for multiple states? Do you have a business slogan or catch phrase? Give reasons why your business clearly beats the competition? What is your USP (unique selling proposition)? Customers tend to look for information as a priority over shopping on-line. They may surf at other sites, but they will continually return to the sites they trust intuitively and can solve their problems. A visitor may need to return many times before making a purchase (studies suggest as many as 5 times). What can you do to encourage customers to purchase now and abandon the need to continue to search? Web surfers have short attention spans. Web surfers may not remember your site and will probably not return unless you give them a compelling reason to do so. How can you encourage repeat visitors and referrals? Every measure should be taken to encourage visitors to voluntarily submit their e-mail address. Free offers, contests, referral forms, surveys and requests for information forms can be useful tools to encourage e-mail signup’s. What can you offer that can be digitally delivered on site (computer wallpaper, screen savers, special reports, on-line coupons, affiliate programs, etc.) and is free? Include unique content on your site. Partner with a content provider to update content. Since most surfers are seeking information, the best sites are those that become hubs or portals. A site that contains large amounts of information (not readily available elsewhere) directly related to the product or service being sold may be far more successful than one that that only offers a product or service. When coupled with a quality design and competitive products and services and outstanding customer service the site becomes a winner. Will you use an affiliate program? Affiliate programs are useful for any or all of the following: allows 3rd parties to market your products and services for a commission, tracks effectiveness of individual advertisements and marketing campaigns, some allow customization to manage signup of individuals or companies with personalized self-replicated web pages. Other companies use them to allow customers to create self-replicated web pages which link to the new mini-cd style personalized business cards. It is very important to have a plan to control on-line fraud. Too many charged back fraudulent orders might result in termination of your company’s merchant account. The possibility of blacklisting by other merchant account providers can be a serious problem. Use manual authorization and accept no unmatched orders (even if there is an approval code). Call to authorize international orders, ship only to billing address listed on credit card, double check on large orders with overnight shipping, refuse on-line orders from customers with free e-mail domains. What can be done to add value to products and services? If your prices cannot be competitive, what other methods will showcase your products/services? The addition of free bonuses, lifetime warranties, free shipping and handling, upgrades, etc. will often be perceived by the consumer as value-added especially if a dollar value can be attached to these extras. Will you use a survey form to gather information from your visitors? What questions would be included on this survey? Will you offer an incentive to customers for taking part in this survey? Surveys can also be used as exit strategies to gather useful information as visitors leave the site. A cookie can be used to eliminate seeing the form for repeat visitors. Customers will probably buy if there is immediate delivery. How long does it take for an order to be received? A customer will not buy from a site if it does not show a complete cost breakdown of their order (price, tax, shipping, etc.) on-line. Will you join any affiliate programs and link those sites to your web site? You can signup on related sites programs and get a commission on sales made on your site. This works best when other sites are directly related to your web site and affiliate links are worked into your site in context. Third party product endorsements work better than simple links to other sites. Will there be password protected areas for dealers, members and/or downloads? Will your site use any digital delivery systems to individually password protect each customers download? Are wholesale prices, drop shipping arrangements or other standard agreements put into a dealer section? Will you allow others to offer your products or services directly on their sites? Will low price lead in products be followed with sales on the back end for higher priced products and services? Products up to $20.00 meet little resistance while products in the hundreds or thousands of dollars may require a longer sales process. Complex services might only be closed using real salespeople. Is a plan in place to secure and qualify leads? How can you remove as much risk from the buyer as possible (warranty, return policy, etc.)? What is your sales cycle? Can you close sales on-line without human interaction or do you need to follow-up on leads generated? Do you have a brick and mortar or other off-web locations or contact point (like a mail order catalog)? How do you see the web site and off-line business working together? What are the weak points of each and the strong points that can be exploited? Don’t try to recreate a catalog showroom on the web. Use the web site to drive people to your physical location. To handle customer service support after hours, offer on-line coupons that can be printed and redeemed at the physical location (and vice versa) use the physical location to promote the web site. Is this a new market you are trying to create for your product/service or is there already an existing market? Selling in an existing market is easier and less risky. The understanding of what you are offering already exists since other companies have paved the way. What existing distribution channels are you able to tap? Are there any 1000-pound gorillas and if so, how can you compete against them? Amazon and Walmart are considered to be gorillas in their markets.